Bethel Park PA: Offensive Backs and Receivers for the 1970 Bethel Park High School Football Team. 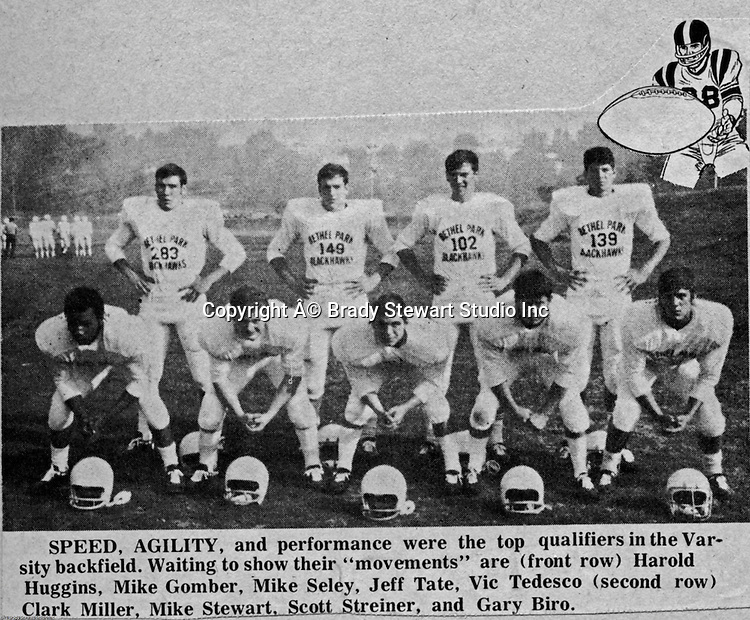 Chip Huggins (RB), Mike Gomber (RB), Mike Seley (RB/FL), Jeff Tate (RB), Vic Tedesco (FB), Clark Miller (FB), Mike Stewart (RB), Scott Streiner (QB), Gary Biro (TE). The 1970 team had more players winning 4-years scholarships than any other class. Division 1: Dennis Franks (Michigan), Mike Stewart and Joe Barrett (William & Mary), Scott Streiner and Glenn Eisaman (Cincinnati), Division 2: Jim Dingeldine (West Liberty), Clark Miller (Clarion).